A federal appeals court in California ruled on Thursday that the Environmental Protection Agency’s (EPA) decision to ditch a proposed ban on a pesticide linked to brain damage in unborn babies and young children violated federal law. The ruling generated embarrassing headlines for the Trump administration as it rolled out a number of attention-grabbing proposals that are also expected to face serious legal and legislative hurdles. 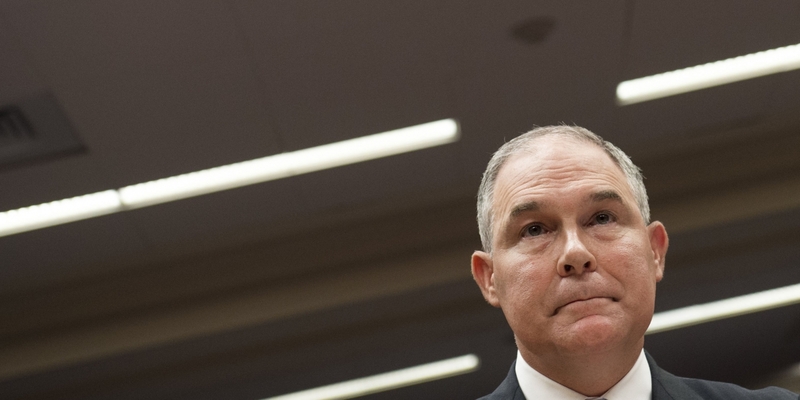 Scott Pruitt, President Trump’s disgraced former EPA chief, signed an order shortly after taking office in March 2017 that reversed steps by the Obama administration to ban the decades-old pesticide chlorpyrifos on farms. The insect-killing chemical was banned for household use in 2000, and advocates have petitioned to remove it from the food supply for more than a decade amid mounting evidence that chlorpyrifos can harm developing brains. In a ruling that scolded the agency for ignoring its congressional mandate to protect the public from dangerous chemicals, the Ninth Circuit Court of Appeals ordered the EPA on Friday to finalize a ban on chlorpyrifos within 60 days. The court said there was “no justification” for Pruitt’s decision to reverse course on banning the pesticide because the EPA had scientific evidence showing that chlorpyrifos residue on food causes neurodevelopmental damage to children. The Trump Administration and the U.S. Environmental Protection Agency are facing three new lawsuits regarding recently amended practices regarding the use of certain pesticides which have been linked to cancer. A coalition of conservation and public health groups have filed suit against the Trump Administration and the U.S. Environmental Protection Agency, accusing the federal government of foregoing an assessment of a pesticide known to have harmful health effects, as well as suspending training for pesticide handlers. The Center for Biological Diversity, Center for Environmental Health and Californians for Pesticide Reform filed suit against the EPA head, Scott Pruitt, accusing him of failing to protect endangered wildlife and the environment by abandoning a safety assessment of the pesticide malathion. In order to truly appreciate the gravity of the situation, and why the EPA’s approval of RNAi corn intended for human consumption, is so concerning, it will first require a little background information on the fascinating topic of non-coding small RNAs, and their formidable relevance to our health.